After glazing the products are sent to the packaging section for weight and packaging. 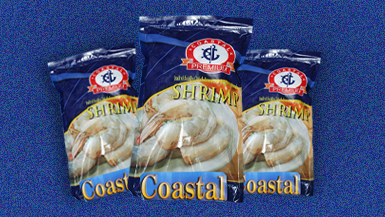 Packaging is done in approved, quality checked and pre labelled pouches meant for the specific buyer. All the products are packed in their own brand labels as per the EIA norms and policies. The sealed and packed products are passed through a stringent metal detector test to rule out the presence of any metal fragment. Finally the product goes to the cold storage for a safe storage under free air circulation, before it goes for shipment.